This was our ride today — 15.81 miles. That’s the longest ride I’ve done for a long time. I loaned Zelda to a friend for the ride so both horses got a great workout. Today was our hunt club’s Poker Ride. For those of you who haven’t participated in this type of riding event, a Poker Ride is like a Hunter Pace where you are not timed (you can ride at any pace) and you pick up chips along the way. At the end of the ride you trade them in for cards and the team with the best hand wins. Poker Rides are great for the summer, when riding at a hunting pace may cause heat exhaustion. They are mostly a good excuse to get out and ride a nicely marked route and catch up with your friends. Today’s ride was in the town next to mine. I’d heard that the ride itself would be relatively short — the estimate was 5-6 miles. I was riding over with two friends so we decided to hack over to the start. It’s was a bit over three miles each way so we were anticipating riding about 11 miles . . . 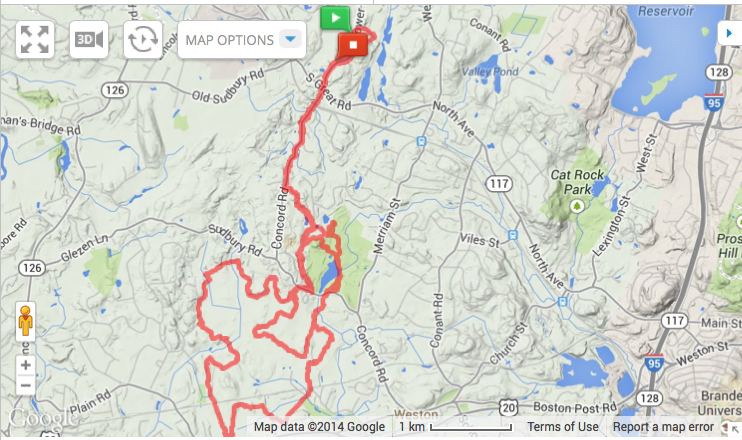 The course, however, proved to be nine miles, so we ended up riding 15.8 miles! It was a beautiful day — mid 70s, low humidity — but when we got back to the barn, horses and riders were all pretty tired. But what a great way to spend a couple of hours. ALS Ice Challenge on Horseback?